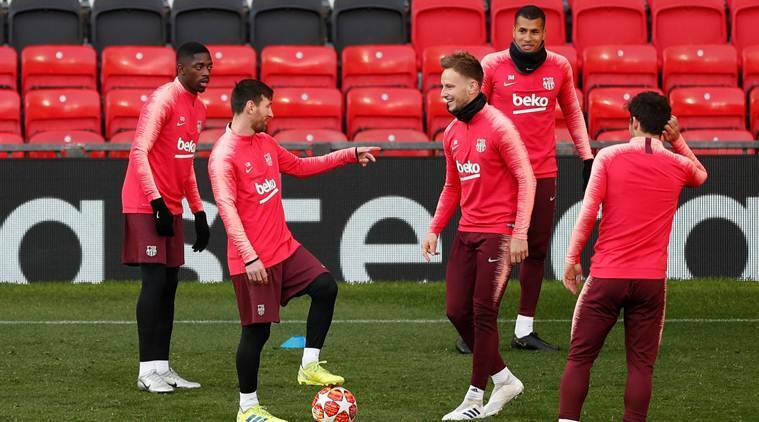 Barcelona defender Gerard Pique has urged his side to make sure they do not leave Manchester United room for another heroic comeback in the Champions League when they visit Old Trafford in Wednesday’s eagerly-awaited quarter-final first leg. United made history in the last-16 by overturning a 2-0 home defeat against Paris St Germain to win the tie on away goals with a dramatic 3-1 victory in the French capital, underlining the club’s reputation for stirring European revivals. “The PSG game should serve as an example for us that you cannot afford to leave Manchester United alive, if you can beat them with lots of goals then you have to do it,” Pique told a news conference on Tuesday. Pique, 32, spent his first years as a professional with United, joining the club aged 17 but returning to Barca in 2008 after failing to hold down a place in the team due to fierce competition from Rio Ferdinand and Nemanja Vidic. Pique has turned into one of Barcelona’s best ever defenders in his 11 years back at his boyhood club and is on course to win an eighth La Liga title with the Catalans, who are also in the Copa del Rey final and have the treble within their sights. But he said his experience at United was invaluable to his development. “I went from being kid to an adult here, I had my first experiences as a professional and some crazy experiences off the pitch. I came here alone, without my family, I learned a lot and I left a completely different person,” he recalled. Pique also said United coach Ole Gunnar Solskjaer helped him through difficult times in Manchester when they were teammates, and he praised the former Norway forward for reviving the club’s fortunes since succeeding Jose Mourinho in December. Barcelona said later on Tuesday that Ousmane Dembele was fit after he missed the previous four games with a hamstring injury. The Frenchman has not played since Barca’s 5-1 last-16 second-leg victory at home to Olympique Lyonnais on March 13. Barcelona’s Luis Suarez can expect a hostile reception from Manchester United fans in Wednesday’s Champions League clash but that will be nothing new for the fiery Uruguayan. Suarez, who joined Barca in 2014 from United’s fierce rivals Liverpool, has 20 goals in La Liga this season, trailing only teammate and close friend Lionel Messi in the scoring charts. His time in England was similarly prolific but punctuated with incidents that left a sour taste. United will know all about the threat Suarez poses on the pitch when they host Barca in the quarter-final first leg, but also the ugly aspect of his game which sometimes rears its head. The Uruguayan inspired Liverpool to a 3-1 win over United in 2011, but his behaviour in the same fixture the following season garnered a lot more attention. Suarez was found guilty following a FA investigation of racially abusing United’s then defender Frenchman Patrice Evra and hit with an eight-game ban, although he denied the charge. That incident tarnished Suarez’s time in England, in which he also got a lengthy suspension for biting Chelsea’s Serbian defender Branislav Ivanovic and was repeatedly accused of diving. In Spain, his combative playing style has rarely endeared him to opposing fans but Barca defender Gerard Pique believes he remains vital to the Catalans. “There are many players that when they are on your team they are indispensable and when they are your opponents you hate them, and Luis is like that,” Pique said ahead of Wednesday’s game. Remarkably, Suarez has not scored away from home in the Champions League since September 2015, yet he tends to thrive in intimidating situations like the one that is bound to await him at Old Trafford. He struck a superb goal to break the deadlock against Atletico Madrid in Saturday’s tense Liga title showdown, curling a shot into the far corner and becoming the first player all season to beat Atleti keeper Jan Oblak from outside the area. In his previous outing at Villarreal, Suarez scored deep in stoppage time to rescue a 4-4 draw, while in February he struck twice in a 3-0 win at Barca’s eternal rivals Real Madrid. Suarez was also decisive in his first trip back to England after leaving Liverpool for Barca, netting twice in a 2-1 win at Manchester City in the Champions League in 2015. United fans gave their former player Angel di Maria a fiery reception when he returned in February with Paris St Germain yet it inspired the Argentine to star in his side’s 2-0 win. The sight of Suarez is likely to ignite far more fire among United fans but they should beware of awakening a player who seemingly relishes the feeling that it is him against the world.